Praying to God individually is powerful however, there is something more powerful about a husband and wife coming together to pray. There are so many benefits to praying with your spouse until the devil fights so hard to keep you apart. When you know the benefits of praying together, you will not want to let a day go by without coming together to pray. Matthew 18:19-20 says “Again I say to you that if two of you agree on earth concerning anything that they ask, it will be done for them by My Father in heaven. For where two or three are gathered together in My name, I am there in the midst of them. ” James 5:16 also tells us to pray for one another. So it is important for a husband to pray for his wife and for a wife to pray for her husband. I realize that in some marriages one person wants to pray and the other one does not. If this is your situation, be encouraged and keep praying. One person praying is certainly better than no one praying at all. There are various reasons that couples give for not praying together. Sometimes men/women are reluctant to pray with their spouse because they feel uncomfortable, they don’t think they know the right words to say, they feel that their spouse is more spiritual and will criticize or critique their prayer. Another common reason couples don’t pray together is simply their busy schedules don’t connect. I want to encourage you to press beyond all of the reasons and establish a daily prayer time with your spouse. Once you start, you will see how a few minutes of praying together will greatly impact you and your marriage. Praying together brings so many benefits to the marriage. It promotes unity, builds communication, understanding, produces spiritual intimacy and sexual intimacy, Praying together will revive a marriage and any situation that may be dead. Prayer changes things, prayer changes people and changes situations. When you don’t know what to do, pray. When you are tired and frustrated, cry out to God and He will answer. Prayer is so powerful until we really can’t afford not to pray. Don’t let the enemy rob you of the blessings that God brings from praying together. 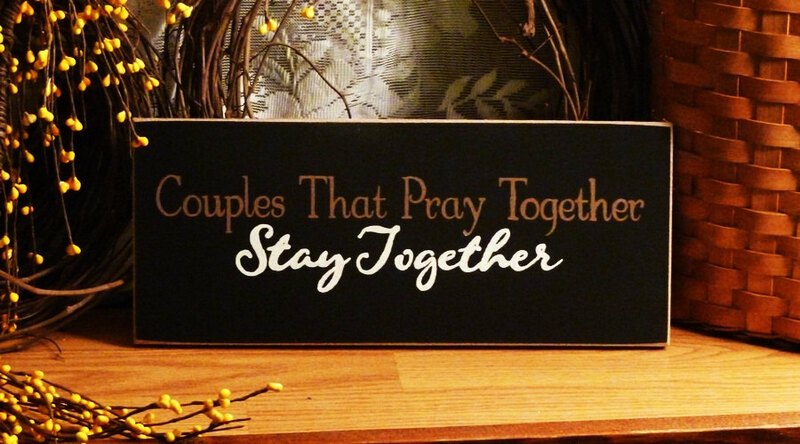 I truly believe that a couple who prays together will stay together.